Social Media and Blog Consulting Program for AIM Services, Inc.
Home » Results » Case Studies » AIM Services, Inc. AIM Services, Inc. needed to grow awareness around their services and increase attendance at their events. When they reached out to Mannix Marketing for guidance for social media consulting and training services. This marketing program was sponsored in part by Stewart’s Shops. 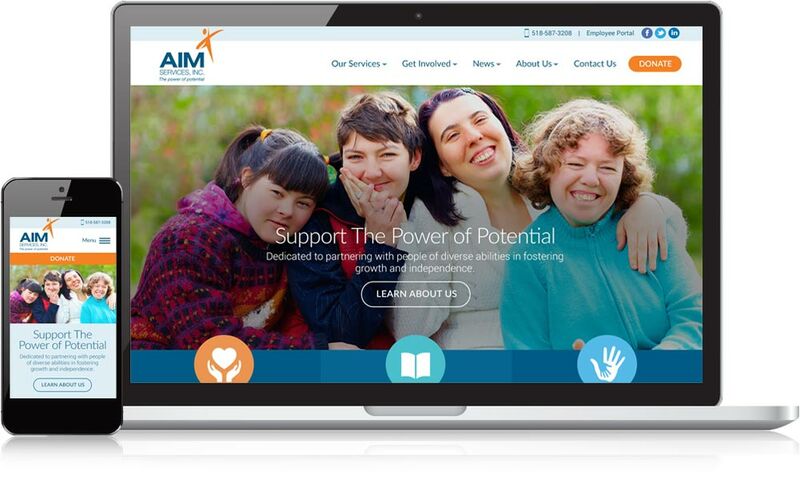 While AIM Services had an existing Facebook page at the start of this program, there was considerable room for improving it to help reach their goals. We performed a social media audit to highlight the opportunities for optimizing their Facebook page and posts, and explained how they could utilize this platform to increase awareness for their services and events as well as relations with the local community. In addition to performing a social media audit, it was important for AIM Services to understand the big picture of how social media would fit into their overall business strategy, so we developed a comprehensive social media marketing strategy that mapped out the what, how, and why behind social media for their non-profit. With a plan of attack in place, we then consulted with AIM Services on how to properly implement the social media and blogging techniques. From providing hands-on training to addressing specific questions to assigning blog and social media “homework,” each aspect of the social media and blog consulting program gave their team ample opportunity to apply the techniques and receive immediate feedback on how to fine-tune their efforts for optimal results. Another top priority for AIM Services is to get more exposure for their local events. Promoting the events through our regional guide Facebook pages, coupled with the social media consulting, made it easier for AIM Services to spread the word about these events and reach a targeted group of potential attendees online. In light of this program, it’s no surprise that AIM Services was able to double the profits and attendance at their Wine Gala in 2015! Through a more robust website and thoughtful Facebook presence, our overall referrals from social media have increased a whopping 107%. Traffic to our website from Facebook has increased dramatically by 1,044% (not a misprint!). But that tells only a part of the story; Mannix’s personal touch and genuine connection with our mission resonated with our key stakeholders to ensure the deliverables we need to survive and thrive in the future.